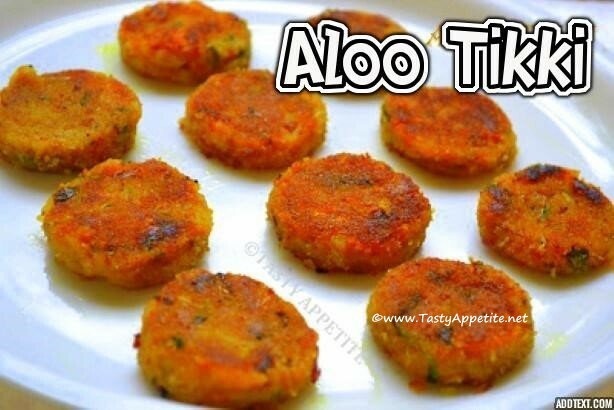 Here comes the ever popular snack of India, Aloo tikki, which is a healthy & stomach filling appetizer recipe. It will satisfy your spicy cravings for a light tea time snack or a best accompaniment with tomato ketchup & mint chutney. It tastes crispy delicious on the outside and soft chewy inside with spicy tempting flavors. I prepare these tikkis often as it is easy to cook and it makes a real treat to tastebuds for kids. Learn how to make aloo tikki, a favorite of generations of India with this easy video recipe. Wash and boil the potatoes until soft. Peel off the skin and mash it completely. Add corn flour, rice flour, salt, cumin pwd, red chilly pwd, amchoor pwd, sliced green chilly, coriander leaves, garam masala pwd, turmeric pwd and lemon juice. Grease hand with oil and knead the dough to smooth ball. Take a lemon sized portion and roll to round shape. Now pat it to thick patty (disc shape) as shown in the video. Roll the patty in bread crumbs and set aside. Heat 2 tbsp of butter or oil in frypan for shallow frying. Place the patties gently on the hot oil and fry in low medium flame. Once the patties or golden brown and crispy on one side, flip it gently to the other side. Fry until both sides of the patties are golden and crispy. That's it lipsmacking healthy delicious aloo tikkis are ready. It serves best with tomato ketchup, mint chutney or any dip of your choice.